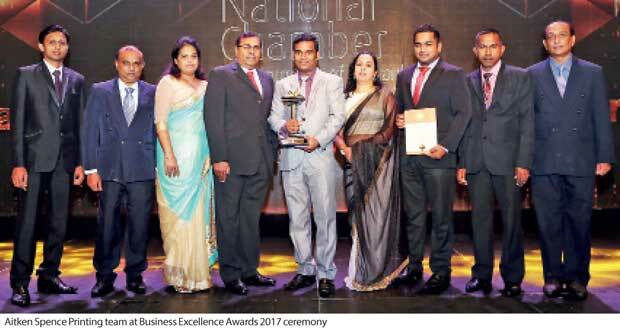 Sri Lanka’s leading printer, Aitken Spence Printing was recognized for the fourth consecutive year as the industry’s best, by winning the Gold award in the Printing and Related Services category at National Business Excellence Awards 2017. The recognition is proof of its position as the ‘best-in-class printer’ in Sri Lanka, which has pioneered many innovative benchmarks and enriched the industry with sought-after professionals over five decades. “Winning the gold award consecutively in the printing and related sector is reflective of our commitment, every day, to deliver value-oriented, innovative and sustainable printing and packaging solutions to our stakeholders. We take this opportunity to express our sincere gratitude to all our customers and other stakeholders for their precious and continuous contribution, guidance and support to achieve this recognition,” said Aitken Spence Printing Managing Director Prasanna Karunathilake.